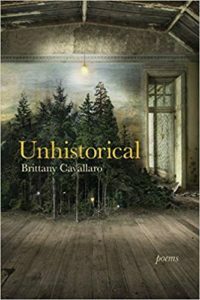 Unhistorical draws on historical narrative, confessional poetry, and detective fiction to tell the story of a contemporary romantic relationship that begins in Scotland and falls apart in America, as the narrator finds herself in the role of spectator to her partner’s genius. Many of these poems draw from the elegiac tradition, following a speaker who is, at turns, tourist in and historian of a landscape that is foreign to them. The middle section of this manuscript, entitled “The Resurrectionists,” follows an alternate version of Sir Arthur Conan Doyle’s Holmes and Watson as they journey to solve a mystery in Scotland while grappling with their own anguished friendship. Order at UA Press or on Amazon. 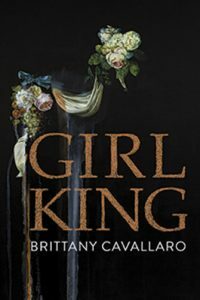 The poems in Brittany Cavallaro’s Girl-King are whispered from behind a series of masks, those of victim and aggressor, nineteenth-century madam and reluctant magician’s girl, of truck-stop Persephone and frustrated Tudor scholar. This “expanse of girls, expanding still” chase each other through history, disappearing in an Illinois cornfield only to reemerge on the dissection table of a Scottish artist-anatomist. 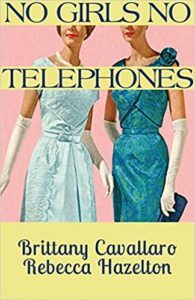 But these poems are not just interested in historical narrative: they peer, too, at the past’s marginalia, at its blank pages as well as its scrawls and dashes. Always, they return to the dark, indelicate question of power and sexuality, of who can rule the city where no one is from. These girls search for the connection between “alive and will stay that way,” between each dying star and the emptiness that can collapse everything. Brittany Cavallaro and Rebecca Hazelton began with the proposition that the opposite of a dream song might be waking speech. Or a sleepless anthem. Or wakeful silence. Then they reversed that notion, and reversed it again. Through an intrepid, always devoted, often cheeky engagement with John Berryman’s The Dream Songs, the 26 poems in No Girls No Telephones strike out for an unmapped horizon where ruined fairy stories, dreams, and self-deception all collide in a perfect storm of “the possibility of Past and Perfect” and “the certainty of the Now and New.” These poems are no mere act of homage. Suggestive of the brittle aspirations, illusions, and delusions that permeate our everyday lives, No Girls No Telephonesinvites us into a world where, “naïve on the rim / of a glass teacup,” men and women exist at odds with one other and with a frighteningly indifferent, fiercely beautiful world. Order at Black Lawrence Press or on Amazon.